Armed with wheat paste, spray cans, brushes and paint buckets, Mr. Brainwash put aside the camera and started attacking the streets in 2006 with stencils and posters of beloved icons and quickly becoming a renowned figure in the burgeoning street art scene. 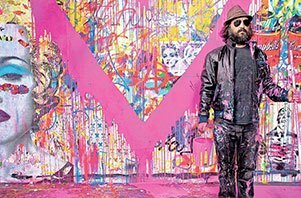 Now, Mr. Brainwash has brought his street art to six continents and attracted hundreds of thousands of visitors to his massive solo art shows. He has created cover artwork, album campaigns, music videos, and installations for a variety of the most iconic figures and brands including Madonna, Michael Jackson, Dalai Lama, The White House, Coca Cola, Levis, Mercedes, Product Red, and many others.